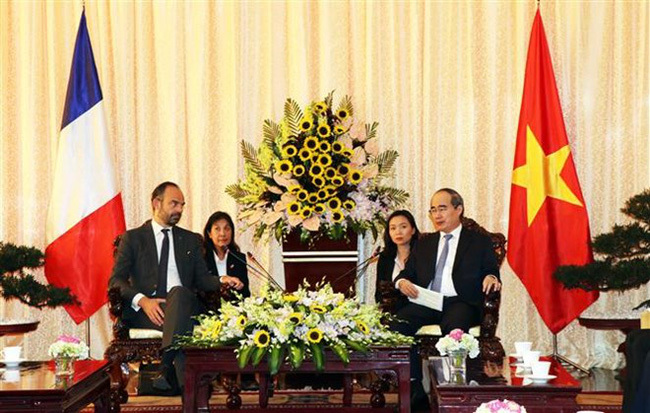 VTV.vn - As part of his official visit to Vietnam, French Prime Minister Édouard Philippe attended a meeting with Secretary of the Ho Chi Minh City Party Committee Nguyen Thien Nhan on Sunday. At the meeting, the French leader said that he hopes the city's leaders will continue to support France in the implementation of the French House project and the expansion of the French International School Marguerite Duras. Meanwhile, French businesses are encouraged to invest in Ho Chi Minh City in terms of smart city construction, high technology, human resource training, climate change and waste treatment. The Secretary of the Ho Chi Minh City Party Committee said that he hopes to receive support from France in preserving cultural, historical and architectural monuments that bear traditional French symbols in the city. Earlier, the French Prime Minister met with startup businesses at the French Tech Vietnam Forum and attended the opening ceremony of the French Medical Center in Ho Chi Minh City.